Rocky shores is the common name of shores made of hard material like granite, basalt or softer material like chalk or limestone. Most sublittoral rocky habitats are in areas exposed to water movement, which keeps the rock surface free of sediment. 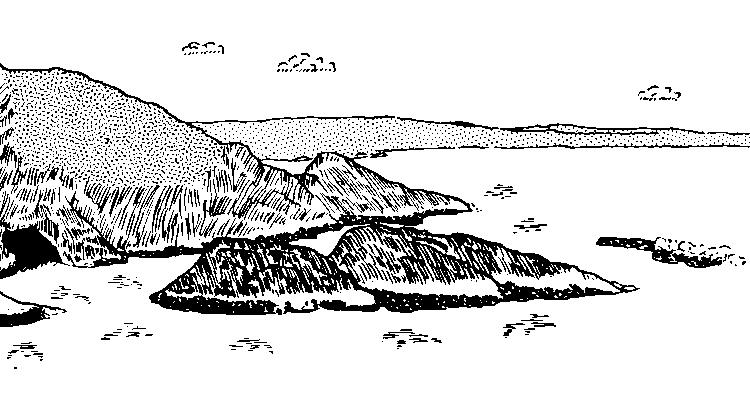 Where sublittoral rock habitats occur they tend to be immediately adjacent to the shore, fringing islands, headlands, open coast and rocky inlets such as rias and sea lochs. 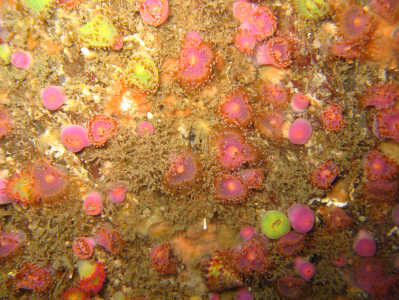 Further offshore, rocky sublittoral habitats may be present as submerged reefs, pinnacles and ledges, and are often surrounded by areas of soft sediment. Rocky shores can be found around the world. In tropical regions, when we look below low tide level, they're amostly covered by coral reefs. Here we'll concentrate on rocky shores that are not covered by corals or by kelp. Coral reefs and kelp communities are treated apart. Rocky shores are known for their great diversity of animals and plants. A thorough survey of such a cost rarely reveals less then a thousand species. In general, the intertidal zone tends to be colonized by algae in wave-sheltered conditions, and by limpets, barnacles and mussels as wave-exposure increases. Deeper down we will find algae and animals belonging to almost any known phyla. 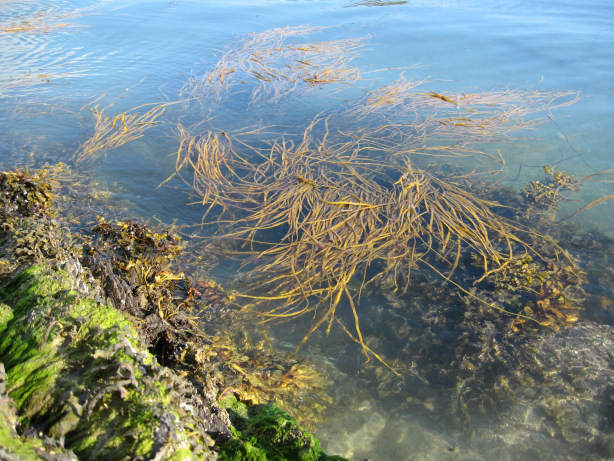 In temperate zones clear water conditions will facilitate subtidal kelp beds on the rocks. Relatively soft rock such as chalk and limestone can support boring species, whereas colonization of basalt and granite is limited to rock surfaces. Two islands of Lough Ine, Ireland. The fucoid algae (dark) replace the barnacles (white stripe) as the degree of shelter increases. When you look closely at the marine life on a rocky shore you will see that species are not evenly distributed. Going from from land into the sea you will pass horizontal bands or zones of different species. For instance going down you may pass zones of barnacles followed by mussels and/or fucoid algae and, further down, red algae. What is the cause of this zonation? For more than fifty years biologists have been studying the cause of zonation of rocky shores. The situation is complex, there appears to be much variation, but let's generalize to get the idea. The upper limit of most species seems to be determined by the physical conditions. In upper shore variation in physical conditions can be strong. Organisms will have to tolerate waves, desiccation at low tide and strong variations in temperature and salinity. These conditions will act as a ceiling to their distribution. For many species the lower limit seems to be set by predators or grazers. At these depths the conditions are good enough for the predators or grazers to exploit their food supply. In experiments where these animals were removed the horizontal-band-species appeared deeper down. An good example is the distribution of mussels. At depth predation by starfish may be so high that mussels cannot survive. In the well lit parts of the rocky shores macroscopic algae form a food source for many animal species. Both in temperate and tropical waters different species of limpets, gastropods, chitons, amphipods and sea urchins use these algae as their main food source. Rocky shores also form a good attachment point for benthic animals, especially on vertical rock faces and in deeper parts where there are no algae. Attached animals, which filter plankton out of the sea water, profit from the fact that the water mostly has few silt or sand particles. Their fine filtering mechanisms will be disrupted as often as in more sandy or muddy areas. The numerous carnivore species will have to move around to find their prey.